Open back headphones are an excellent way for listening music without feeling ear fatigue. As the name suggests, open-back headphones are a kind of audio equipment that have open ear cans. If you’re new to this concept and can’t understand it, hold on – check this article to know more about it. However for other folks, here is the list of Top 7 Best Open Back Headphones under $150-$200 that come from a respectable brand and will definitely blow your mind. 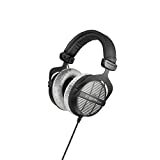 Hence don’t be shocked if you happen to see couple of Sennheisers in our list of under $200 open back headphones list. Now without wasting much time, let’s jump into our list of Top 7 Best Open Back Headphones under $200. Audio Technica as we all know is an excellent audio brand that has churned out commendable headphones and earbuds one after the another. Not only they have series of excellent closed back headphones, the Japanese company also has elite range of open back headphones too. One of the prestigious headphone from this elite range is Audio Technica ATH AD900X that has a complete industrial studio headphone like design that mean serious business. Specifications wise, the headphone has a very large 53mm driver in both cans that is able to deliver a natural and stress-free sound. Due to open back design, there happens to be free flow of air that helps in enhancing audio played through the cans. Even though it has round ear pads, it will be comfortable to wear for most people because of the big size and provided earpads do not apply stressful pressure on your ears. Talking about its design and build quality, you’ll first notice its 3D Wing Support that adjusts to head size of the person who wears it. This 3D Wing Support are an excellent alternative to a typical headband which may not be comfortable for everyone. The box in which it comes is pretty basic as well, nothing fancy there too. However you don’t get any accessories except the 3.5mm to 6.3mm converter. There might be people who won’t like Audio Technica ATH AD900X’s design, build quality or/and structure, however one department the AD900X doesn’t dissapoints is its sound. As with all open back headphones, the AD900X too has a wide sound stage which is difficult to be matched by closed back headphones. The sound is bright and breezy that makes a great addition for listening rock, jazz, acoustic and similar genres. Even due to its low impedance of 38 Ohms, you don’t need an external amp to power it. It’s all plug and play out of the box. If you’re looking for the best open back headphones under $150, there’s no other better option than Sennheiser HD558. On my initial trial of this headphone, I found the sound output to be flat and crass, however with a little bit of burn-in period brings out the gem of a sound this headphone beholds. Available in industrial Black color with matte finish, the Sennheiser HD558 is for serious buyers who need a premium and professional looking headphones at an highly affordable price. The HD558 are a great budget and affordable option as I believe it’s the best open back headphones for gaming once you attach a ModMic5. Though the cable is detachable, one distadvantage they have is that the single-sided wire ends into a 6.3mm jack rather than a usual 3.5mm jack, however the brand does provide a 6.3mm to 3.5mm converter too. Moreover for the price, the packaging too is very basic, which I believe is kind of a let down as everyone likes a premium unboxing experience considering the price you’re paying. However one thing that I should give them is that this budget open back headphones comes with very big oval earcups that will fit any ear size and the brand has added velour padding to the mix. Looking for open headphones with solid bass response? Then surely the HD558 won’t disappoint as it packs plenty of bass that will do total justice to your rock songs, heavy metal and jazz, however if you’re into electronic, hip hop and dubstep I’d suggest looking elsewhere. Though the overall material used in building this headphone is plastic, it surely doesn’t feel cheap nor will you feel the headphones will fall apart if it accidently falls off the table. To be honest, you really don’t need to worry about built quality when it comes to audio devices from Sennheiser. Looking at the design of the AKG Pro K612 you may like it very much or might downright hate it. Honestly, this headphone is not meant for average consumers as the brand markets them as Reference Studio headphone that makes them to be the best open back studio headphones under $200. Before we start talking about the headphone itself, let’s just a small peek at the entire packaging. As much dissapointed I was with previously mentioned Sennheiser HD558 packaging, I’m more happy with the overall unboxing experience of the AKG Pro K612. This AKG open back headphone comes in a very big box, which also features a similar black box inside that carries the word ‘Expect’. The black box inside has a velcro opening that adds to the surprise and you find the K612 sitting inside. However for people like me; who loves accessories inside the box; will be dissapointed, as you get the headphone itself and nothing else In the box. The design on the other hand is similar to Audio Technica ATH-AD700X without the 3D wing support or AKG’s very own semi open back headphones like the AKG K240 MK II. What I love more is the velour padding that you also get to see in the previously mentioned Sennheiser HD558. This definitely reduces the headphone weight, moreover you get leatherette covered headband without any padding that also adds in keeping the weight at minimal. However I would have loved if the AKG could have provided a detachable cable option; as most of the times the cable breaks leaving the entire working headphone useless. Trust me, I’ve thrown many headphones just because of damaged wires. Sound quality wise they do pack in a punch and are much better than other headphones in similar price, and since they’re open air headphone; you get a wider soundstage compared to other closed back headphones. How would a list about open back headphones be complete without including the brand that is holy grail of open back headphones? For the uninitiated, Grado is a 64 year old audiophile-grade audio equipment brand that has been producing value for money products without any or no frills at all. All headphones manufactured by Grado, be it a low priced Grado SR60e to the Grado GS1000e are handmade and hence you get optimum quality in every headphone you buy. Coming to the popular Grado SR225e, it features Grado’s trademark old-school radio-headphone like design which hasn’t changed much over all these years. Its thin headband with no fancy leather padding helps in reducing weight and the antenna-like headband adjuster are easy to use and simple in design. You also get a thick hard-wired cable that feels very strong and you won’t have to worry about accidentally yanking them and breaking it. Many people may find it hard to adjust their ears to Grado’s earcups if you’ve spent your whole life using heavy padded earcups, however with time you’ll do appreciate it as well. With all those years of building quality headphones, there’s plenty of refinement in the way the headphone sound. The sound happens to be more open as it can get and for audio enthusiasts, you can very well differentiate the stereo seperation more clearly. Grado SR225e’s hand down are great headphones while listening to rock and acoustic music along with a bit of jazz and cello music, whereas on the other hand there’s a slight bump in the low end and you won’t feel a cringe while listening to modern pop and bass filled songs. One place where Grado SR225e’s shine is the high-end frequency, you don’t feel distortion in sound and it doesn’t even happens to be hard on your ears as the sound doesn’t crackles. As I mentioned earlier Sennheiser was the first brand that introduced the world to open-back headphones that inturn introduced the world to acoustically open sound that was no match to other headphones back then. The brand has continued to the same philosophy with it’s most stylish affordable open-back headphone i.e. the Sennheiser HD598. The HD598 is available right now in two colors: Black and Ivory, out of which I like Ivory the most as the design looks fresh and it easily stands out among a bunch of black colored over ear headphones. It comes with detachable cable functionality and in the box you get 3 meter cable in size. 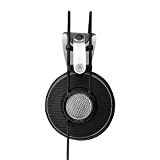 These headphone are absolutely stunner in looks and what adds to its excellent build quality is its comfortable velour pads that are much better than leatherette pads and offers the upmost comfort you can ask for. Specifications wise the HD598 has an impedance of 50 Ohms and has capability of producing frequency response between 12Hz – 38500Hz, which gives it a wider soundstage and excellent stereo separation as well. Coming to its sound quality, Sennheiser mentions that HD598 uses the brand’s own Eargonomic Acoustic Refinement (E.A.R) technology that directs sound directly into ears rather than bouncing it off around the earcups. This simply means the drivers inside are angled at a certain distance and hits audio directly into your ears for an uninterrupted listening experience. To be honest, the sound of HD598 matches closely to it’s higher model ﻿﻿HD600 without the need of an external amp. Considering the fact that professional audiophile-grade headphones weigh a lot, the Sennheiser HD598 is lightweight at 294 grams, however I’d recommend to take breaks after every hour, so as to prevent neck ache. If you want the most comfortable open air headphones that would feel like you’re wearing clouds on your ears, Beyerdynamic DT990 are the headphones to go for. All over the audio industry, the soft velour earpads of Beyerdynamic are regarded as the most comfortable earpads and offers excellent support to your ears without feeling exhausted. The DT990 Pro has different design compared to other two variants and looks professional as well. These are excellent designed headphones and I am really yet to find some who doesn’t like the design of this best open back headphones under $200. Moreover the design too slightly resembles to that of Shure SRH1840, however there’s a majority price difference between them. Till now the Beyerdynamic DT990 Pro were available in one color, however there’s another blackout edition available as well that looks extremely lit. Even at the time of writing, the Blackout edition is available at a cheaper price compared to original DT990 Pro. I don’t know why, but I do love the Grill design on the back of earcups and the exposed wiring for each earcups, moreover the metal headband adjustment feels extremely sturdy as well. As I mentioned earlier, the Beyerdynamic DT990 Pro have impedance of 250 Ohms and hence you need either an external amp or DAC to drive, you can check this article to know the DAC compatible with them. For the uninitiated, you can plug these headphones to your smartphone and it will still play music, however you won’t be able to notice its full potential and even at full volume on your device you will notice low sound on the headphones. For starters, let me first mention that Philips X2 Fidelio are the most durable headphones in our list of best open back headphones under $200. 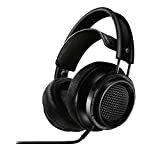 However let me do put forth that at the time of writing, the X2 Fidelio are costing slightly over $200, however if you want a very good sounding and durable open air headphones, spending an extra $20 won’t be an issue at all. The Philips X2/27 Fidelio’s acoustic open back architecture offers pristine sound quality and its double layered ear shells are engineered for precision sound. Moreover it features a 50mm drivers that are large enough to produce large frequency response between 5Hz – 40000Hz. Philips X2 are the top-of-the-line model in Fidelio series and hence there are no compromises made either in build quality, specifications and sound quality of this headphone. Moreover since it has an impedance of just 30 Ohms, you do not need an external amp or DAC to driver them and can easily work alongside with your smartphone. The Philips Fidelio X2 is known for its bassy response but still has a linear sound presentation without overpowering other frequencies. Though the X2 is on the heavier side weighing at 380 grams, the kind of built quality and sound quality offers is totally worth it. However I still do feel Philips should have given weight a priority as it’s the most heaviest open back headphones in our list too. Most people also happen to use the Fidelio X2 as a primary gaming headphones, however I would discourage doing so as the weight will put stress on neck muscles during long gaming sessions.